Normal Check-In Time is between 3:00 PM and 5:30 PM. What if I am arriving after regular business hours? No worry’s, we understand flight delays and schedule changes. Just give us a call us at 904.285.5585 to confirm and we will arrange for you to obtain your keys upon arrival. Check-out time is before 10:00 AM. Sorry, but no exceptions! We need to get busy preparing for the next Guest. Drop the keys at the office and let us know how much fun you had during your stay! When you find the property of your choice you can either book the property online or call us at 904.285.5585. When making your reservation we do require full payment. We have a variety of pet friendly properties available for rental; please view all our pet friendly properties or contact a Reservationist for assistance finding a pet friendly home. Is there a fully equipped kitchen in all vacation properties? All properties feature kitchens and standard household items including cable or satellite TV, central air/heat, microwave, coffee maker, toaster, pots and pans, dishes, utensils and glassware. Some houses have telephones. Unique and specific equipment and/or amenities for each property are listed in the individual property descriptions located on our website. Hot tubs, additional TVs, VCRs, DVDs, deck furniture, recreational games and equipment, and similar items are furnished as a courtesy by the owner and are not guaranteed by Suncastle Properties. Each property is supplied with bed linens, bath and kitchen towels and bath and kitchen amenities, so everything will be ready for you to kick off your shoes and relax! At the end of your stay, please be sure that all linens remain in the property. During peak season (January – April) there is a 7-night minimum for all of our rental homes. During mid and low season the minimum stay is two nights except for the following holidays: Memorial Day, Labor Day, Christmas, and New Year's (3-nights); Thanksgiving (4-nights). If check-in is within 45 days of your booking date then the full amount is due by credit card within 24 hours of booking. If check-in is more than 45 days from your booking date, your signed paperwork and advance payment (approximately 50% of the rental fee, plus the non-refundable reservation fee, damage protection fee and optional Travel Insurance premium) must be received within three days of the booking date. Please remove all food from cabinets and refrigerator. Bag all trash, including bathroom trash and place it in the outdoor receptacle for your property. Load all dishes in the dishwasher and start the wash cycle prior to your departure. Place all used bath linens, bed sheets and pillow cases on the bathroom floor. Turn off all appliances, ceiling fans and lights, lock all doors & windows and return your keys to the rental office by 10AM. Yes, housekeeping may be arranged during your stay. Please arrange mid-stay housekeeping prior to your arrival so we can discuss your needs and schedule. Fees for these services vary. 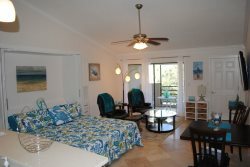 All of our vacation homes have internet in the home. Check with a Reservationist regarding your property's amenities. Is there a BBQ grill available at the property? BBQ grills along with other specific amenities are listed in the individual property description. Grills and similar items are furnished as a courtesy of the owner and are not guaranteed by Suncastle Properties. Several of our vacation properties allow access to Sawgrass Country Club; check amenities on the property page to verify if your home offers temporary memberships to the Country Club. If the home you are staying at offers a temporary membership you will has access to the Beach Club, Fitness Center, Tennis and Dining at the Golf Clubhouse and Beach Club, Pools, and Social Activities are included in all Memberships. Unlimited Golf & Tennis options are available. Ask your Reservationist for up-to-date information. Some subdivisions have pools and restrict use of their amenities to guests staying in that subdivision. Ask your Reservationist for up-to-date information regarding amenities and pool availability in your property's neighborhood. Can I order a Pay-Per-View movie or Sporting Event? Call and speak with a Reservationist about your property's access to this service prior to check-in. Neighborhood association rules prohibit parking these types of vehicles at the grounds of any property or along the neighborhood roads at any time. There are several self-storage facilities nearby, ask a Reservationist for more information. If you were not able to find an answer on our website, please contact us directly at 904.285.5585 and one of our Reservationist's will be happy to assist with your questions and help you find a vacation rental home for an exceptional getaway in Ponte Vedra Beach.